NBC News is reporting hundreds of trampoline park injuries have been reported across South Florida. A two-year investigation determined more than 300 calls to 911 have been placed from trampoline parks across South Florida. Assistance from paramedics was needed on at least 70 occasions. Strains and sprains are common, as are falls. However, some of the most serious injuries occurred when two or more users collided. 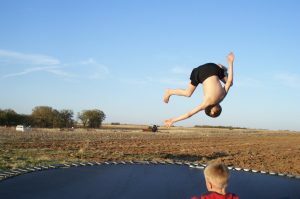 Head injuries, broken bones and spinal cord injuries are also risks, particularly if a user misses the trampoline and lands on the floor or other hard surface. Trampolines have a long history of product-liability and personal injury litigation. Still, their popularity continues to grow. A 2016 study by the American Academy of Pediatrics found trampoline park injuries increased more than 1,000 percent in four years. A number of personal injury lawsuits have been filed, claiming negligent supervision. While rules and warning signs are posted, there have also been numerous allegations that facilities do not enforce the safety rules. Unfortunately, Florida law has often cited with businesses when it comes to liability for the actions of other guests. In other cases, manufacturers of home trampolines have been sued for marketing dangerous, defective or unsafe products. Still, parents.com reports nearly 100,000 children a year are injured on trampolines. Injuries to children or tourists in cases involving liability waivers are complex legal matters best handled by a law firm with extensive experience in personal injury, product liability and premises liability litigation. A primary defense in these cases has been companies asserting that guests are not entitled to damages because they signed a liability waiver. Such waivers are common among many types of recreational operators, including sporting events, boat and watercraft rentals, parasail and tour boat operators, and other facilities geared toward tourists. They typically purport to waive legal liability for all serious injury or death in exchange for the right to participate, by claiming such activities may be dangerous or carry inherent risks. Florida Law (F.S. 744.301), allows such liability waivers. The law was passed to reverse a Florida Supreme Court decision (Kirton v. Fields), which had ruled parents or guardians could not execute such pre-injury releases on behalf of minors engaged in commercial activities. The law creates two rebuttal presumptions: that the waiver is valid and that any injury suffered arose from risks inherent to the activity. Under current law, however, businesses may still be held liable for negligence resulting in child injury. Unfortunately, inherent risk is defined to encompass negligent actions of other children participating in the activity. This may eliminate expectation of proper supervision on behalf of the business. However, to be enforceable such waivers must be narrowly focused and specifically tailored to meet the requirements of Florida law. The law requires waivers to be clear and unambiguous and must protect against risks of marketed activities. Waivers do not protect against intentional torts, such as assault. Nor do they protect against injuries not considered an inherent risk to the activity, such as a roof collapse or parking lot injury.